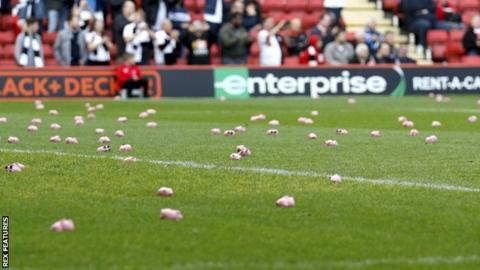 Charlton and Coventry fans threw hundreds of plastic pigs on the pitch in a joint protest that interrupted Saturday's match at The Valley. The supporters were protesting against the two League One clubs' respective owners, and had also organised a joint march to the stadium before the game. Play was delayed for about five minutes while the pigs were cleared. Charlton went on to win the match 3-0, meaning Coventry remain bottom. Fans of the London side have made repeated protests against owner Roland Duchatelet's running of the club. At the end of last season, they threw beach balls and stress balls onto the pitch and Coventry supporters have also been calling on owners Sisu to sell the club. "It was different, I've got to say. Protests are something that's happened down the centuries, that's what we do. "When we're frustrated, people are entitled to voice an opinion and the fans have done that today. All I think is as long as it's done in the right manner and it's done safely, then that's fine. "Our focus has got to be that we're delivering on the pitch and we're working exceptionally hard to do that and to turn it around." "The plastic pigs were hurled onto the pitch from all around the stadium. "It was completely simultaneous - and had obviously been planned in advance by the two pressure groups opposed to the owners of both clubs. "It followed a well-attended joint march from Charlton railway station by Addicks and Sky Blues fans."